Let’s face it, that old favorite western song just wouldn’t be the same if the first line read “Oh give me a home where the bison roam.” Some literary license was necessary in order to make the lyrics flow smoothly. That said, the massive animals that were hunted to near extinction on the American plains in the late 1800s are bison, not buffalo. 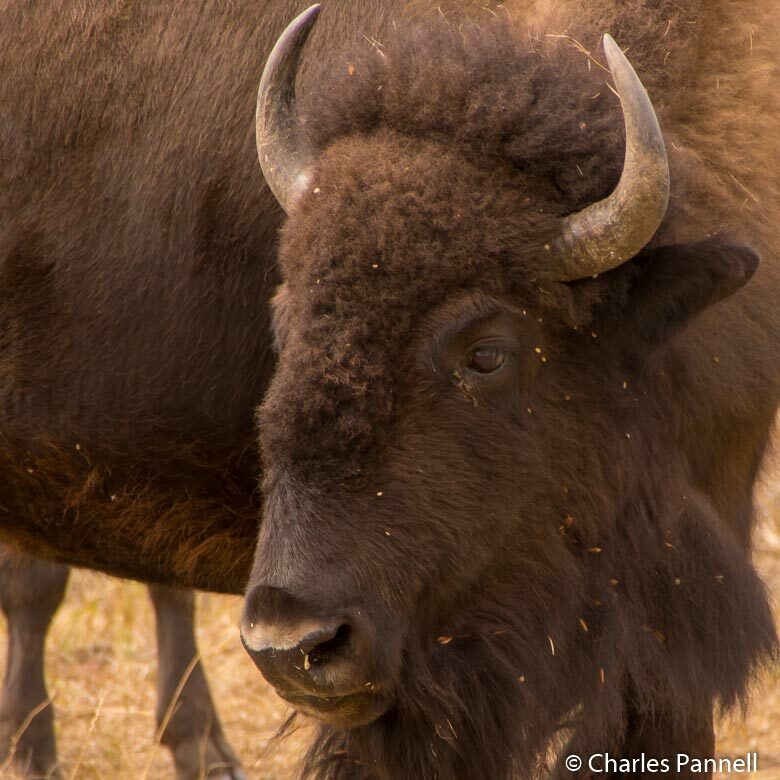 Buffalo actually reside in Africa and Asia — all 38 species of them — and unlike their American bison relatives, many of them have been domesticated. Semantics aside, there are still several preserves across the Western US where you can see these once endangered animals. If Mount Rushmore is on your road trip itinerary, then take a short detour over to Custer State Park (www.custerstatepark.com), which is just a short half-hour drive from the national park. 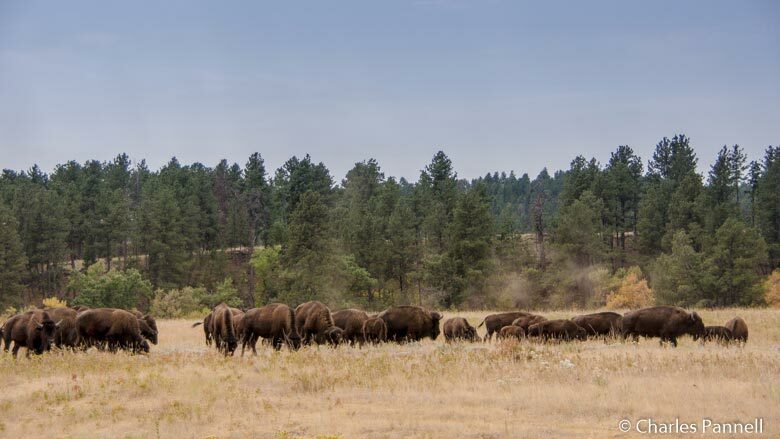 A stop at the accessible visitor center — built from used rocks and logs in 1935 — is a must, but the big attraction in the park is the herd of 1,300 bison. The best place to get a look at them is on the 18-mile Wildlife Loop Road, which is located near the east park entrance. You’ll find all sorts of wildlife on this road; and it’s not unusual for the bison to be right alongside, or even in the middle, of the road. A word of warning — roll up your windows when you see the burros, as they’ll stick their heads in your car and pretty much grab whatever they want. 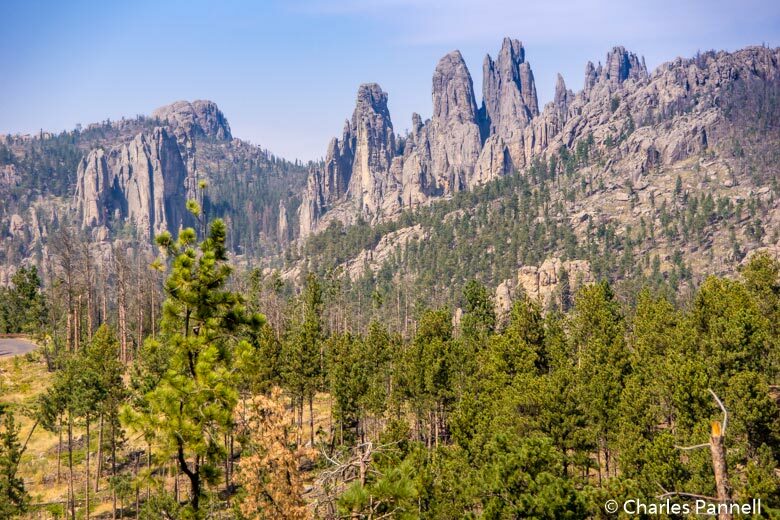 Although many people continue along highway 16A to Custer, the Needles Highway Scenic Drive is the better way to exit the park. Take a right on Highway 87 and follow the signs. Named for the needle-like formations and cathedral spires that dot the landscape, the route traverses a Ponderosa Pine forest and passes through three narrow tunnels. There are lots of accessible places to stop and enjoy the view, but make sure and use the pullout right before tunnel five, for a great view of Little Devil’s Tower and Cathedral Spires. After that, you’ll get up-close-and-personal with the spire-like formations, as the road cuts right through them. It’s a once-in-a-lifetime drive. Located about 2.5 hours northwest of Butte, off Highway 93, the National Bison Range (www.fws.gov/refuge/National_Bison_Range) makes a great road trip stop on the way to Glacier National Park; however finding it can be a bit of a challenge. After all, you don’t expect the bison to be roaming wild in the middle of Main Street, do you? Just head east on Highway 200 in Ravalli (exit 96) for about six miles, then take a right on Highway 212 in Dixon. The entrance to the preserve is about five miles up the road on the right. Oh, and don’t use your GPS. Accessible parking is available in front of the visitor center, with barrier-free access over to the building. Inside, there’s plenty of room to maneuver around the interpretive exhibits, ranger information desk, and the bookstore. Accessible restrooms are located near the front door. Visitors have two options to drive through this preserve, depending on the season. Red Sleep Mountain Drive heads up to the top of the preserve, before it circles back to the flatlands along Prairie Drive. It takes about two to three hours to complete this drive, which is closed in the winter. Additionally, since it’s a one-way route, there’s no turning back, so you are committed to the whole drive from the moment you begin. That said, it’s a great option is you have a half-day, as it offers a good overview of the highlands and lowlands in the preserve. And you may even spot a bighorn sheep along the highlands portion. If you only have a short time, the Prairie Drive is usually doable in a hour or so. Plus you can always turn around and head back if you run short of time. Along the way, you’ll see plenty of bison, mule deer, pronghorn antelope and even the occasional golden eagle. It’s a scenic drive with plenty of bison viewing; but remember the animals have the right-of-way. It’s not unusual to come across bison in the middle of road, and you just have to wait for them to move along, but then again that’s part of the fun and adventure of the drive. If you happen to be traveling between Glacier National Park and Browning, Montana, be sure and stop along Highway 2 to get a gander at a bison herd with an interesting history. To be honest, this hit-or-miss sighting depends entirely on the mood of the bison. They can usually be found grazing in the hills between mileposts 215 and 216, on the left side of the road as you head towards Browning on Highway 2. There are no tours of the preserve, but there is a small place to pull over near the locked gate. 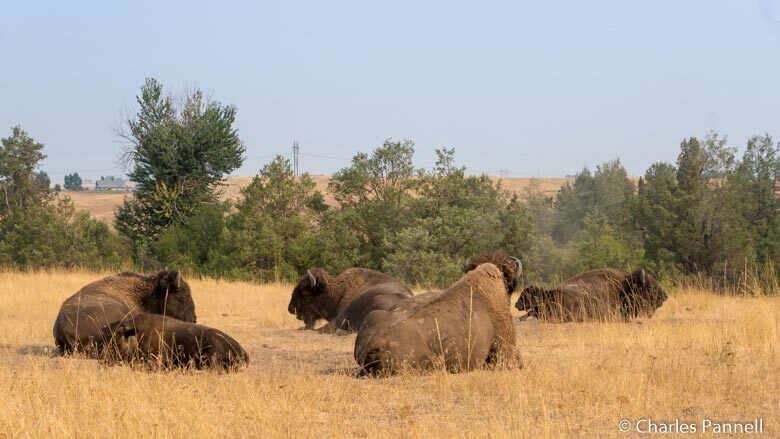 This herd was relocated from Alberta’s Elk Island National Park in 2014, in an effort to restore genetically pure bison to western grasslands. This relocation, which was the result of a treaty between US and Canadian tribes, brought back the descendants of the original Blackfeet herd — which once grazed in the same Montana grasslands — from Canada. And although there’s no guarantee that you’ll see the herd, it’s certainly worth a look on the way to Browning. Affectionately referred to as “bison jams” by the locals, these bison-related traffic delays are difficult to miss in Yellowstone National Park (www.nps.gov/yell). Truth be told, you’ll probably hit one of these daily migrations when you least expect it, so just relax and enjoy these massive animals as they slowly lumber along the road. The most likely place in the park to encounter a buffalo jam is in the Lamar Valley; although since the animals have free range, one can literally happen just about anywhere. Most likely you’ll see the rangers before you’ll see the animals, and shortly thereafter traffic will come to a dead stop. At this point you just have to go with the flow and wait for the animals to pass. 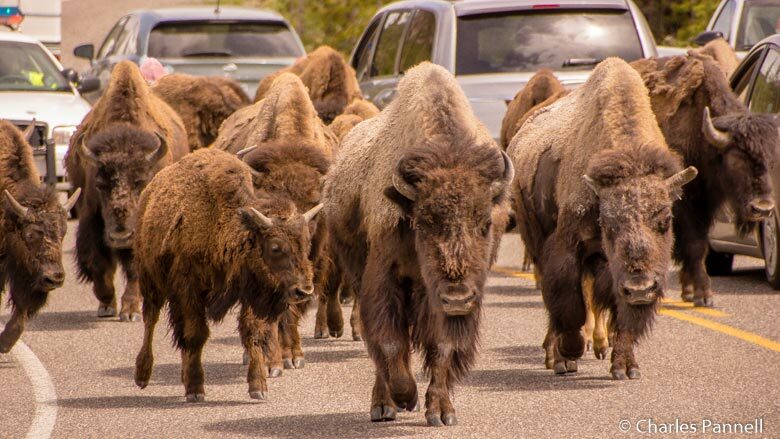 The rangers try and stop traffic so the bison can move around the cars, so when you see a 2,000 pound animal trotting along the road, just roll up your window and enjoy the view. Remember these animals are wild, and they have injured — and even killed — careless visitors in the past. Don’t become a statistic — enjoy them from the comfort of your car.